Reasserting human is the theme of week 3 in edcmooc. I am interested in the different ways of being present on the internet, not only technologies used but human interaction. This post copies some ideas of my blog post a year ago when the first edcmooc began. What are the different ways of human presence in purely online-held courses? I have a personal history of working as an online facilitator and I had a feeling about being closer to my adult students online than f2f. I am convinced that human presence is possible online, but it is not easy to define. I’ll try now to tell shortly about my findings. I have a feeling that edcmooc is similar with my own way of facilitating adult students’ learning. I worked to the end of the year 2009 at teacher education and I’ve participated in many online courses or communities after that. Dialogical space is a necessary condition and facilitators have a role in creating it. Dialogical space is safe and supporting, creative and challenging. It is the atmosphere in which everyone wants to do his/her best and enjoys the work. Presence can be described in many ways and the parts are connected to each other. Facilitating presence includes all actions which help the students to learn. I’ve used the concept “didactical” but it is not used in English and “pedagogical” does not sound good, so I chose the term facilitating presence. Mentoring and tutoring are near concepts. Emotional presence is very challenging and interesting to define. The teacher must be personal, it is not good to hide one’s personality. It is good to locate oneself in some ways. In an online course we took photos about ourselves in a Hangout situation. We could see that we are human beings (with much technology 🙂 ). Emotional connections are between people but also toward online studies. It is good to share problems and solutions and be anxious together. And to build up community humour when it is possible. This all means “being human”. 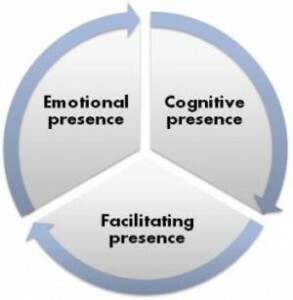 Cognitive presence is easy to understand, but also it is complex in practice. We have a duty to disturb our students intellectually, said someone in edcmooc. It is good to avoid direct guiding , and better to support students as they find their way. The general guide lines must be clear, but thinking and assessing is students’ work, not only teachers’ job. When the community reaches a dialogical state and finds its own working habits, every comment is also a component in the shared dialogue and new connections are found. It is emergent learning, every participant is learning and creating. In edcmooc the photo “competition” in week 3 supports this side of studies, otherwise it could be too serious. The community builds up it own curriculum, and everyone may participate in this process. I took a short glimpse at other theorists in this field. I remember Terry Anderson and the many research groups, who were working on this theme in 2006-2007. This image integrates the basic concepts of Anderson’s presentation. In the middle of the diagram is educational experience. In this image Social presence includes emotional presence. Setting climate connects social presence and teaching presence. Supporting the discourse combines social and cognitive presence. Teaching presence means also selecting and recommending the content. I like the concept of triggering event, it describes the dynamics of learning. Sense of community is another important concept. Otherwise studies can be only external performance. I am myself very sensitive to the atmosphere. I return back to edcmooc again. Professor Fuller links his talk to our key theme of re-asserting the human. His stance seems to be that ‘you can only be morally credible’ if you are addressing issues of human freedom and equality. Thinking about education specifically, we might see MOOCs as an example of an ‘old humanistic project’, particularly in the promise they appear to offer for democratisation, equality of access and so on? I wanted to say that the humanistic project is possible in certain conditions. Often the question about online teaching is that what it is lacking concerning human communication. The solution is in offering videos in which the teachers can be seen. I think that in edcmooc the Hangouts bring the facilitators near us, they are personally present and they have fun as a team, but the most important thing is the atmosphere of equality and enthusiasm all over the studies. We understand elearning and digital cultures from this perspective. We are studying with our facilitators without any hierarchy. This is my view, how about yours?